Changes in Bolt Velocity Imparted by Blowback and Determination of Time for Unlocking. meaningless but between any two values of time, the curve does show accurately what change in bolt velocity would be produced by the impulse. Having the curve of fig. 2-22, it is only necessary to determine where to place the zero velocity axis so that the area between this axis and the curve up to 0.005 second is equal to 0.250 inch or 0.0208 foot. (Since this is a velocity-timc graph, areas under the curve represent displacement.) The zero axis can be located quite simply by drawing a line along the 0.005-second ordinate and measuring the area between this line and the curve, taking the elements of area as shown in the figure and working downward until the area is equal to 0.0208 foot. The abscissa of the point where the line bounding the lower limit of this area intersects the curve is the required time of unlocking (0.00307 second). 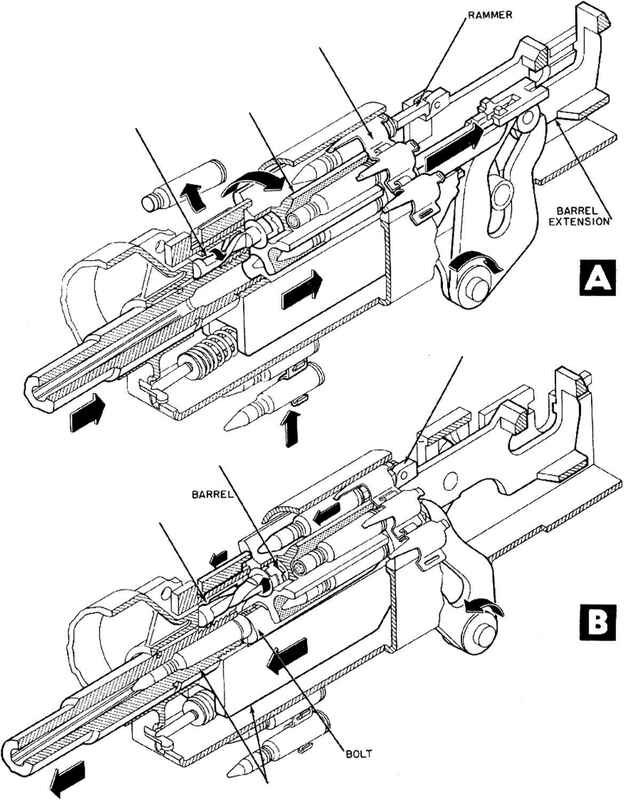 Ordinates measured above the lower bounding line are equal to the free recoil velocity, with respect to the barrel, imparted to the bolt by blowback. The curve shows that the gain in free bolt velocity between the time of unlocking and 0.005 second is 18.2 feet per second. It should be noted that although this computation neglects the retarding effect of the bolt driving spring, the resulting error is extremely small and entirely insignificant.